Friends: Stop by Coastal Bend Health Foods this Saturday, December 3rd, and try our freshly picked red and green tomatoes. Supplies are limited, get them while they last. This Saturday is the Rockport “Tropical Christmas Celebration”, including a tree lighting ceremony and other events in the downtown Heritage District. Coastal Bend Health Foods is a sponsor and offers some holiday discounts for you. 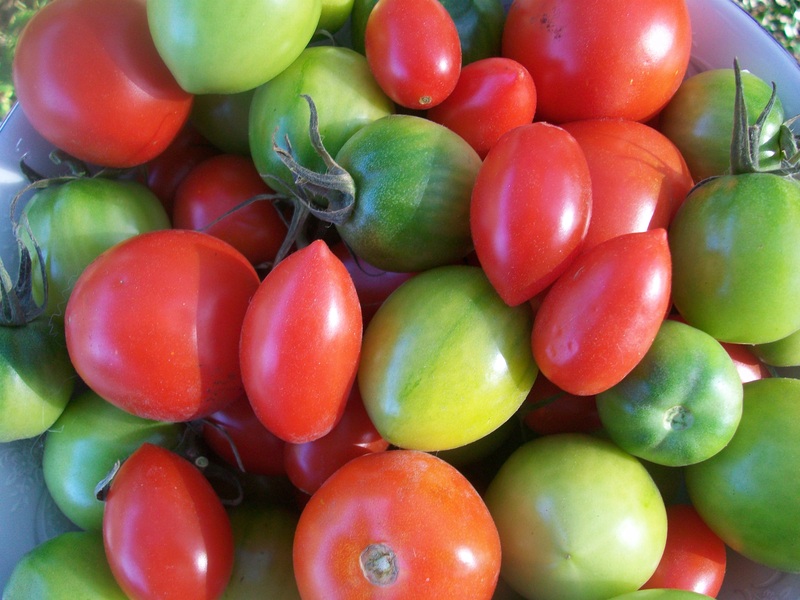 Come celebrate your tropical Christmas with garden fresh tomatoes! Who Would Believe It, Tomatoes in December? We are thrilled to have this last harvest of tomatoes so late in the year. Many of our customers will remember the incredible production of tomatoes Four String Farm enjoyed from April through August, until the night-time soil temperature became too hot for tomatoes to set fruit. We kept all our tomato plants in the ground and continued to water them through the hottest part of summer, to allow us to coax this autumn harvest from the mature plants. The unusually high temperatures in September and October unfortunately delayed the fall harvest, but here we are, finally, with a beautiful crop of December tomatoes. Our first mild frost, a couple of days ago, ended tomato production for the year. It is astounding (and ever challenging to your local farmer) how quickly our weather turned from blistering heat to frost this year. Still, we have had an excellent autumn harvest. The green tomatoes still on the vine will not have the time, or the heat, to turn red and ripen. So, in addition to ripe red tomatoes, we also have baskets of beautiful green tomatoes. Why are These Winter Tomatoes So Sweet? Our poultry and porkers take most of the credit for the wonderful flavor of our vegetables. We pasture our animals on harvested gardens and allow them to eat down the foliage, add their magnificent fertilizer, cleanse the soil, and till the garden for the next planting. There is no way to duplicate the flavor (and health properties) of vegetables grown in a pastured program. We never use any type of chemical pesticide or fertilizer on our gardens–we don’t need to. Additionally, we conduct carefully controlled wood fire burnings on our gardens (except during burn bans, of course) and work all of that wood ash into the garden. Wood ash is a natural soil amendment that adds essential minerals to the garden: calcium, potassium, magnesium, manganese, and other trace elements. The calcium and potassium in wood ash is particularly important to growing tomatoes. Calcium helps prevent blossom-end rot, a common problem for Rockport gardeners. Further, the taste, the sweetness of a vegetable, comes from the activation of potassium in the plant. The potassium in wood ash helps the sugars activate and release in the fruit. This activation creates incredibly sweet and flavorful tomatoes. I love to watch my friends try these tomatoes, and see their faces light up. Each ripe red tomato is a like a concentrated dose of summer, a sweet red taste of the sun on a cold winter day. The green tomatoes are a tangy mixture of sweet and tart, a unique and interesting flavor. 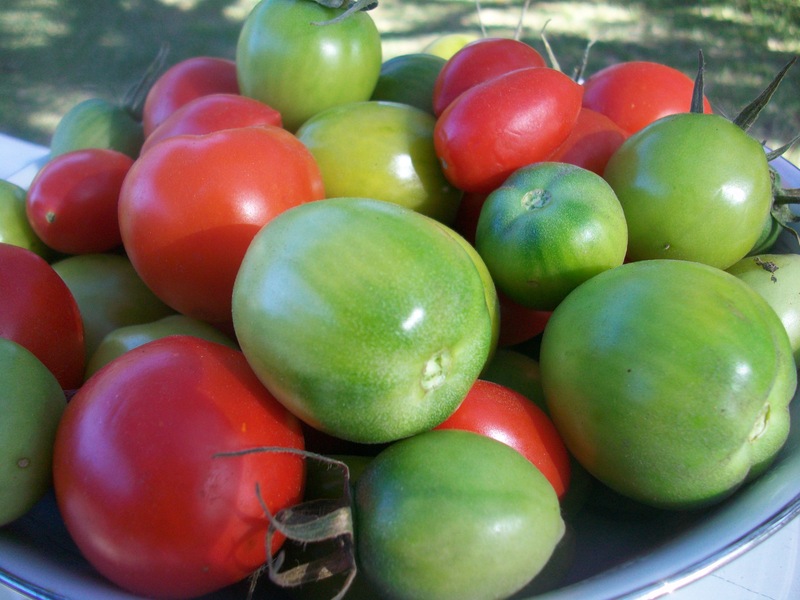 Our green tomatoes make delicious chutney, and are just as good fried in December as they are in March. I must confess, we have a limited supply of our December tomatoes. Our season was cut short, due to the weather. Further, Mrs. Butts and I have been busily picking and canning tomatoes as fast as they ripened this autumn. When you live on a farmer’s wage, you don’t have a lot of cash for Christmas presents. However, we have been blessed with a wonderful gift that is very rare in these parts: garden fresh Christmas tomatoes. I hope it doesn’t ruin the surprise for some you who are reading this, but at least you will not know if it is salsa, marinara, green tomato chutney, or one of Kayla’s other delicious creations, in your stocking this Christmas. But for now, we are out of canning jar lids and are generally canned out. The rest of our tomato harvest is at Coastal Bend Health Foods, waiting for you. Stop by tomorrow and get your red and green Christmas tomatoes!